Highlights of this episode: President Heller is alive. Jack threw Margot Al-Harazi out of the window. Steve Navarro turned into the bad guy. Chloe’s on a date with creepy Adrian Cross. Everyone has gone haywire. So what do the hosts think? Rob thought this was a great episode with so much to do. It felt almost felt like a finale. Josh thinks it’s the best episode of the season by far and the best 30 mins of the season was the first 30 mins. 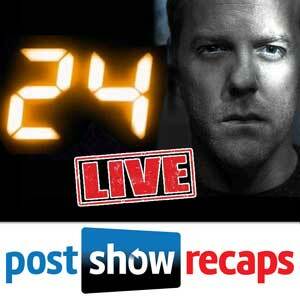 24 is at its best when it’s racing against the clock, and that is just what happened in the first 30 minutes of the episode. Josh confesses his heart was pounding during the invasion of Margot Al-Harazi and thought about how compelling it was. He thinks it’s an exciting episode which is punctuated by the amazing death of Margot. Now Josh has to go back and update his vulture list of the “24 Best Jack Bauer Kills” because this episode is definitely on there. 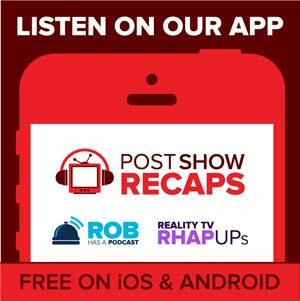 Rob asks Josh if the episode ranks in the Top 10 and Josh said it is definitely on the Top 20. Rob is a bit bummed out that they didn’t have the balls to kill off President Heller. Josh actually suspected that President Heller was alive. The silent clock was a big telltale sign. Other signs would be that you don’t get to see Jack’s perspective of Heller’s demise, Chloe is messing around with the drone technology, and Jack is disagreeing with Heller’s plan to kill himself. Josh recognizes the fact that Heller can cheat death and this is a historical fact on 24. Rob asks if Josh thinks it’s a dishonest storytelling considering they trick the audience into thinking that Heller is dead but he really is not dead but it’s only revealed after a week later. And Rob feels this is a cheat on the part of the TV show. Margot Al-Harazi is dead at the moment. Jack threw her out of the window and Rob was wondering if Jack really had to do that. Josh simply thinks it’s awesome and cool. It was the end of the road for Ian Al-Harazi as well. Steve Navarro has gone crazy on this episode and Rob thinks it’s just fun to see him squirm. Kudos to Ian Al-Harazi for figuring out what was going on and Josh thinks it’s a good quick edit job done by Chloe. Josh thinks Ian is speaking for the audience considering that he was second-guessing Margot all season long and asking her if she’s really sure about destroying all the drones. Josh is pumped with Belichick and Bauer, his favorite, new combo on 24. Belichick is a good friend (although Jack claims he doesn’t have friends) and he doesn’t take orders from the US President because he is not an American citizen anyway. Rob and Josh talk about the devil side of Jack Bauer being the love mole in the classic Boudreau situation. Now back at the house, Margot Al-Harazi is just totally pissed and there is one drone left and they’re gonna make it count. They’re bringing it to the Waterloo Station which is the biggest train station in London. If you were Margot Al-Harazi, would you go for maximum loss of life or go for a bigger landmark instead like the Big Ben? Josh thinks both of these work, basically depending on what she’s after – a symbolic victory if she goes for the landmark; while getting more innocent deaths on her hand is also better. The hosts assume that Adrian Cross is a legitimate Chloe fan. Rob is wondering what Chloe sees in Adrian who is just so creepy, and Josh thinks Chloe just likes the Brits or she simply has a bad taste in men. Steve Navarro didn’t get killed in the fake out decoy plan and Rob thought that would’ve been a good plan being able to kill two birds with one stone had he been killed back there. Erik Ritter is back and the hosts are pretty glad “Purple Erik” is back. Rob says that the mission here is to take out a gated junction box and Josh says the best way to do that is through a grenade. Kate Morgan definitely has a good aim. Jack ends up landing the helicopter up on the roof while Kate Morgan and Erik are in a big fire fight. Josh basically just likes everything about the episode, mentioning this is one of the best action sequences on 24. Josh really thought that Margot was really gonna kill Ian when she points a gun on him but that didn’t happen though. Rob actually thought Ian was gonna turn around and kill Margot instead. Credits to Jack for driving the missile into the water. While Kate and Erik are still fighting, Jack lowers himself like Batman. Josh thinks this is the thing that makes him Jack Bauer. Nine hours ago Jack is the wanted guy and now people are taking orders from him. Well, what Jack wants, he gets. Josh says Belichick is the Madonna of mercenaries. The hosts are actually surprised to see Jordan Reed not making it out alive. It didn’t make sense that Jordan got killed by Steve Navarro. Chloe calls Jack and gets in the car with creepy Adrian Cross. Rob likes how Steve Navarro is totally nosy about Bauer. It was a fun scene. We all know Steve is the mole. Rob asks if Audrey has to be blamed for the bad things happening to Jack. Josh thinks that Jack really has to ignore Audrey’s call. It was an alpha move for Jack. Jack comes in and Steve unfortunately gets away. Josh is disappointed that Jack couldn’t track down Steve. Chloe and Adrian doing a make out scene is totally creepy. There are only 3 episodes left on 24 and Josh is sad the season is gonna end soon. He thinks the season has gone really fast although the last couple episodes have really picked up the pace. Not really moving as fast as he wanted in the early part of the season but right now it’s full speed and he’s loving it!